I don't talk about my day job too often (besides the one about being a mom). As you know, I am a registered dietitian. I work full-time in a nursing home. How I got here is kind of a funny story. See, I was newly married and living in an apartment in Kalamazoo, MI. I had graduated with my bachelor's degree back in April but did not get placed in a dietetic internship like I needed to to become a dietitian. My dad is an optometrist and since I was not placed in an internship, I decided to try to go to school for that. I had to take about 5-7 classes in order to qualify to apply for optometry school. I decided to take these classes at a community college and hated it. I was taking physics, chemistry, biology, etc. I knew that I was not happy with this but was not sure what to do. I started looking for jobs online although I could not do much with just my bachelors degree without being a registered dietitian. I saw a job at a nursing home which I thought said in Southeast Michigan. My husband and I were planning on moving there in a few months after he graduated college so I thought I would apply figuring that I would never get a call. Later that day, I got a call from a high-up manager in the company asking me to come in for a job interview. I found out that the job was actually in Southwest Michigan, 3 1/2 hours from where we were wanting to move. I took the interview anyways for experience. Something felt so amazing and so right about it. I was offered the job and took it as a dietary manager of the nursing home including doing all clinical work and all kitchen work. Within a week at the job, I knew that dietetics was the field for me. I dropped my classes at the community college and never looked back. See, I knew that I was meant to be a dietitian. I love food. I love nutrition. I love the healing power of food in disease and disease prevention. Everything felt perfect once I started this job. I think that it is important to pick a field to go into that has jobs and that you can make money but it is also very important to pick something that you love. Dietetics is where I am meant to be and I cannot imagine a better field for me. I remember being nervous to tell my dad that I was not going to do optometry but he (and my mom) completely supported me. We ended up buying a mobile home 25 minutes from my job and I worked there for two years. I didn't write about this much when I worked at that job but it was a very, very demanding job. I was on call 24/7 and if a cook or dietary aide called in, I was expected to get there ASAP to fill in. This was very stressful because if I was out of town or did not answer the phone right away, the resident's would have to wait to eat. I was treated poorly at this job and got calls all through the night. It taught me so, so much about what I wanted in a job and what I did not. I was 20 years old when I was hired at this job and there, I really grew as a person. I believe that everything happens for a reason and it was meant to be that I applied to this particular job. The reason that I stuck with it was to be able to get my dietetic internship and because of an amazing mentor named Bonnie. She was the corporate dietitian and she taught me so, so much about how to be a professional, about keeping a kitchen clean, about clinical dietetics, etc. Most of all, she was a friend and someone that I could look to for guidance on any topic. I looked up to her a lot and still do! I applied for my dietetic internship and was placed at Western Michigan University. I went through a variety of rotations including a hospital, school, nursing home, private practice, renal rotation, etc. I took the test to become an RD and passed the RD exam! I finished my Master's degree a year later from WMU. When I finished my internship, I knew that I wanted to continue to work in long term care. I loved helping the elderly people and there was always so much going on. I found a job at a nursing home and have since switched nursing homes. I have been at my current job for about 2 years. I work with patients who are losing weight, are on dialysis, have a feeding tube, wounds, diabetes, heart disease and with any nutritional issues. I love what I do. I think about if I would ever want to change into a different area of dietetics and for now, I am happy where I am at. Every day at my job is different and I love the residents that I work with. I work a tiny bit in the food service area which is nice to switch things up but being a manager of a kitchen is not for me. I am too nice and hate to discipline people! 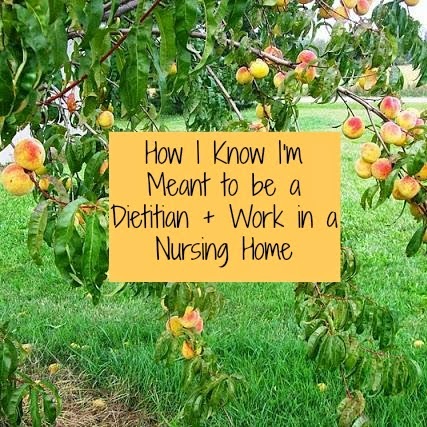 Anyways, this post ended up being a lot longer than I imagined but as you can tell, I am passionate about what I do and think that working in a nursing home is a great place for a dietitian to be! Disclosure: This post is sponsored by BestNursingHomes.com. All opinions and experiences are my own. I do know how very important your job is since I regularly visited a nursing home while my mom was a resident. We often thanked the dietitian for her help and spoke to her often.